The excitement of winning money from nothing is an alluring prospect. Every day, tens of thousands of people around the world are engaged in some form of gambling, hoping that lady luck will help them strike it rich. Unfortunately, for some of us, this irresistible attraction for gambling has developed into an uncontrollable addiction. And just like any addiction, we find ourselves needing more and more ‘doses’ of gambling to give us the same buzz. Indeed, the need we have for gambling is not just a psychological one; our physiology has also been affected by gambling – our bodies have gotten used to the emotional highs and lows that come with each bet that we make. 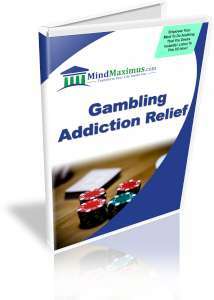 Alas, most sufferers of a gambling addiction find it hard to quit exactly because of the constant urge we get to gamble. When we don’t gamble, we don’t feel ‘normal’. This is an especially dangerous mindset because our finances will continue to take a beating unless we find a way to fix this compulsion. Do you crave to gamble because it makes you feel ‘alive’? Are you constantly thinking about striking it rich through gambling? Do you find yourself neglecting the important areas of your life because you spend too much time gambling? Have you found yourself financially crippled and in debt because of your gambling habits? Although compulsive gambling is a tough addiction to break, it is by no means impossible. With today’s advanced Brainwave technology, we are now able to effectively ‘train’ our minds to dramatically reduce our urge to gamble by eliminating the associations we make from the emotional thrills of gambling to the actual activity. GamWe can thus ‘reset’ our desire to gamble and no longer suffer the adverse effects of this addictive habit! No reviews on E10 Gambling Addiction Relief so far.